This one bedroom apartment in Higgovale is situated on the slopes of Table Mountain. 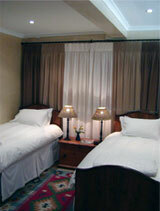 The self-catering apartment is attached to the main house but with its own separate entrance and off-street parking. Your own private and large terrace with dining table, sun chairs, umbrella and Braai-(barbecue) facilities invite you to chill out while enjoying views of Table Mountain, Lion’s Head, Signal Hill and Table Bay. Twin beds in the bedroom can be put together on request and two single sleeper couches could sleep two smaller children. There is one shower bathroom. The kitchen is fully equipped with stove, microwave, fridge/freezer and washing machine.